The turbulance of lives across the country are suffering on many levels. This fact presents an old problem with new faces. 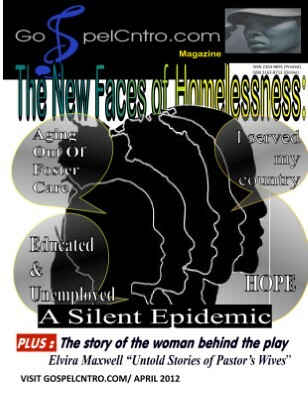 The New Faces of Homelessness: A Silent Epidemic. The April issue covers a few of the newest labels shared along with the label of homeless. Aging Out of Foster Care, Educated & Unemployed and more. Grant writing guides and information for developing programs for the new social needs. Playbill: Untold Stories of Pastor's Wives" by Elvira Maxwell.